News Hounds: Jon Stewart Presents "The Gretch Who Saved The War On Christmas"
Jon Stewart Presents "The Gretch Who Saved The War On Christmas"
Check out the clip from last night's "Daily Show" about our dear "Gretch" Carlson who is fighting to save Christmas from being destroyed by the satanic secular forces of baby Jesus hating secular darkness. But as Stewart points out, "Christmas survived the Roman Empire. I think it can handle the renaming of the Tulsa parade." 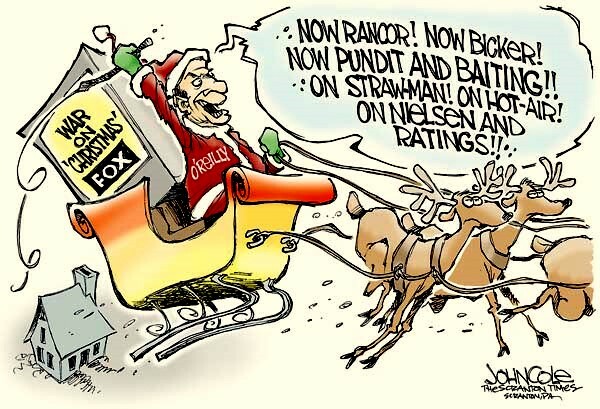 In addition to persecuted and very good Christian Gretchen Carlson, other Fox notables make an appearance in Stewart's cartoon which chronicles this "war on Christmas." He nails it when he says that it just wouldn't be Christmas without "people being offended by nothing." Priceless!